All color is a gift of the Lord. 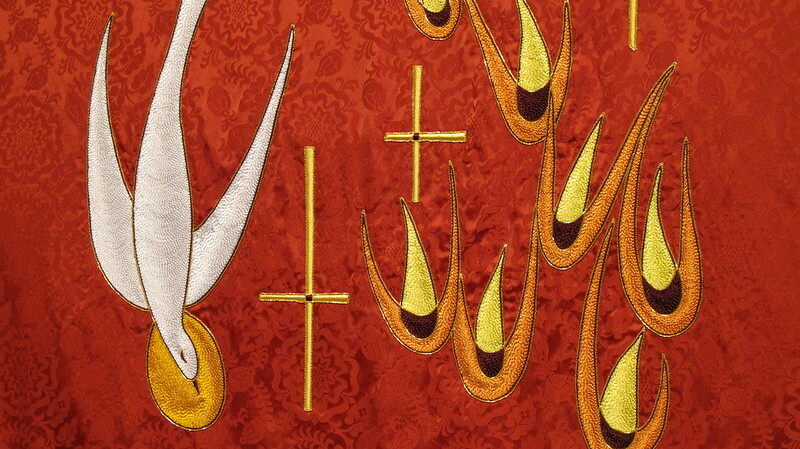 Red is the liturgical color used for the feasts of the Lord’s passion, of the martyrs who followed in His footsteps, Pentecost, and Reformation. God put red in the rainbow he showed to Noah, and promised that he would never again destroy the whole world in a flood. 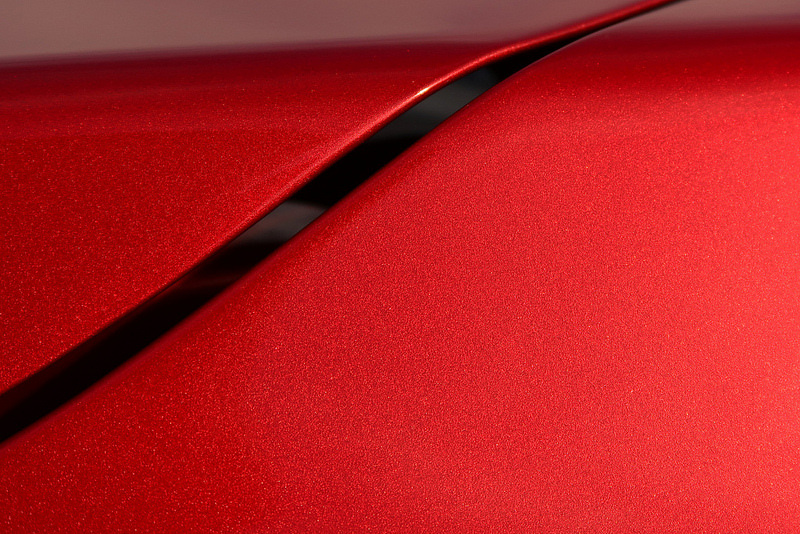 Red is a symbol of sin. (Isaiah 1:18). But it is also the color of Jesus’s life and blood. (Leviticus 17:11). So like the cross, red symbolizes our evil and God’s mercy. 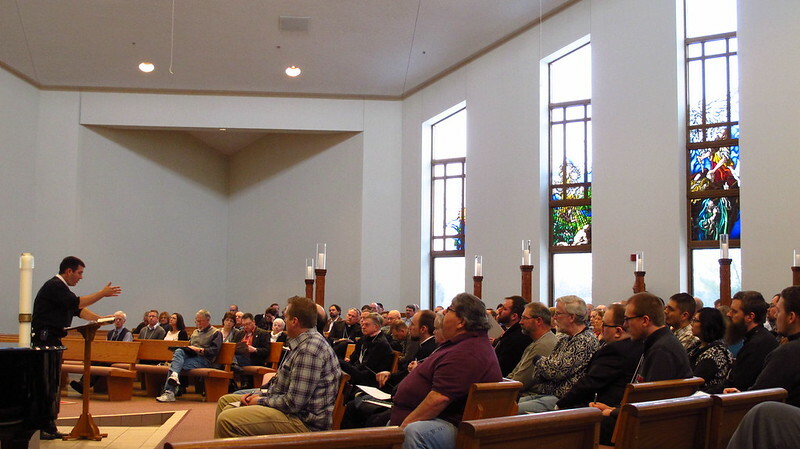 The Brothers Of John the Steadfast held their annual conference in Naperville, Illinois on February 20 & 21, 2015 A.D. It was an excellent conference with a lot of insightful presentations, good food, entertainment, and enjoyable fellowship. 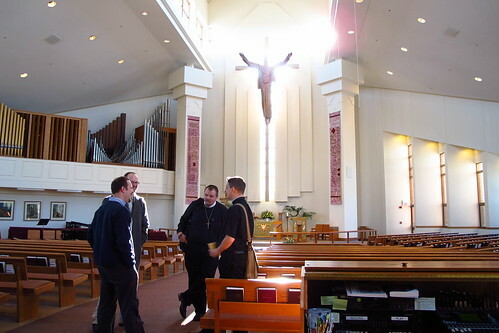 The Brothers of John the Steadfast is a group of mostly LCMS (Lutheran Church-Missouri Synod) laymen and pastors dedicated to promoting Confessional Lutheranism. 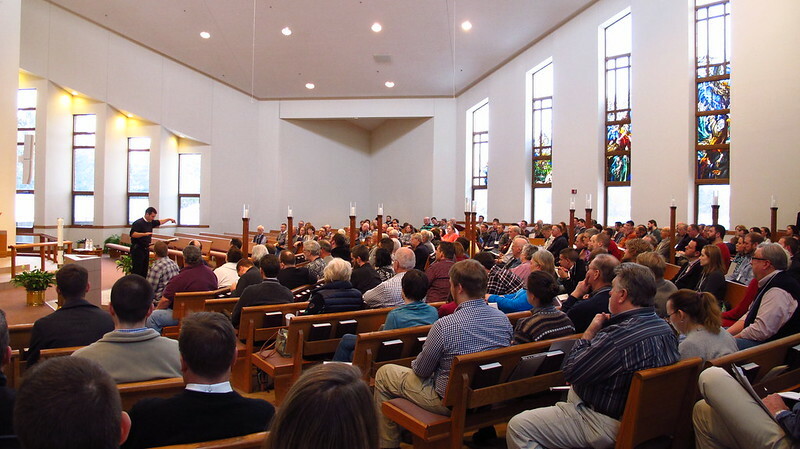 The conference was held at Bethany Lutheran Church and School. All the pictures in this post are from that conference. One of the challenges of taking photos at this conference was the new candle holders that Bethany had installed down the center isle. I tried to incorporate them into the photos as best as I could. 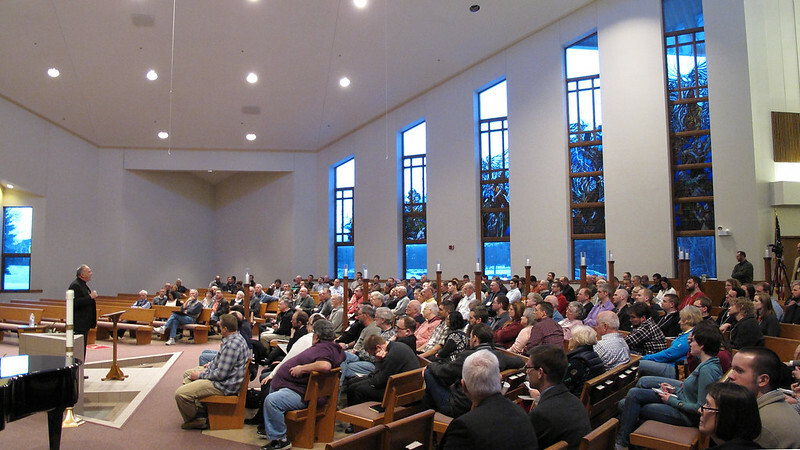 Audio presentations from the 2015 Conference can be found on the Brothers of John the Steadfast website. Video of the conference can be found at this link: on the BJS website. 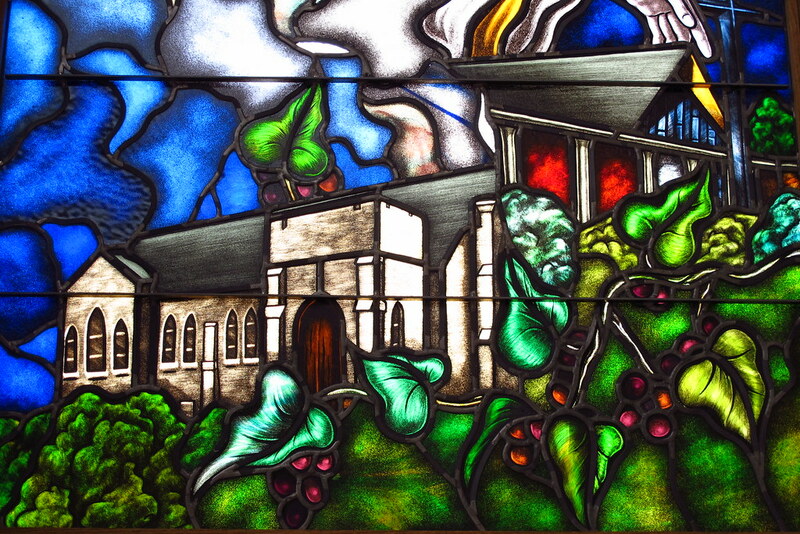 Bethany Lutheran’s unique stained glass windows can be seen in the background. 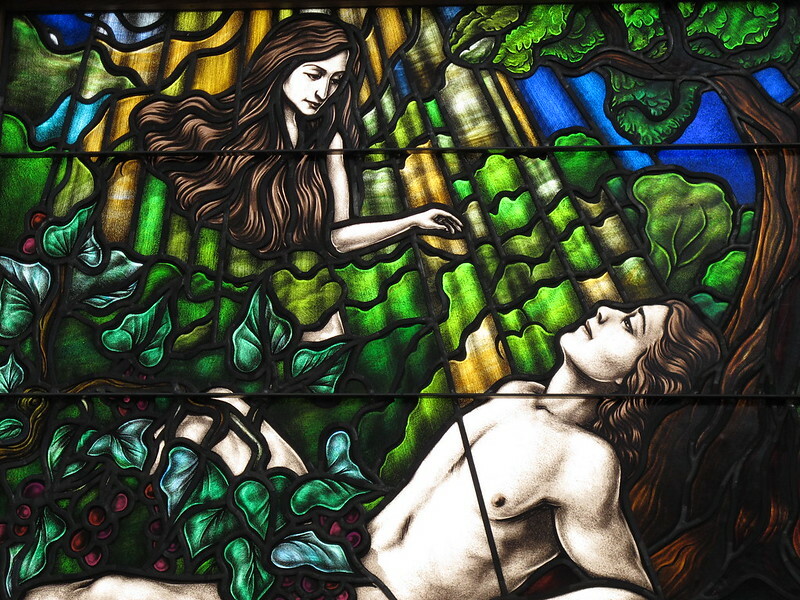 This stained glass window depicts God’s gift of Woman to Man. (God was depicted in the window above this one, and was the source of the yellow rays of light that blessed our original parents). Pastor Rossow introduced the next speaker. Pastor Rossow was an excellent and gracious host. The second speaker on Friday was Pastor Clint Poppe of the ACELC. Dinner followed, and then there was the evening prayer. In commemoration of the martyrdom of Saint Polycarp, the liturgical color for the evening prayer was red. On Friday evening, the Brothers of John the Steadfast gathered in private homes for the “No Pietists Allowed” parties. Then the next morning on Saturday was the “Manly Man’s Breakfast” at Bethany. 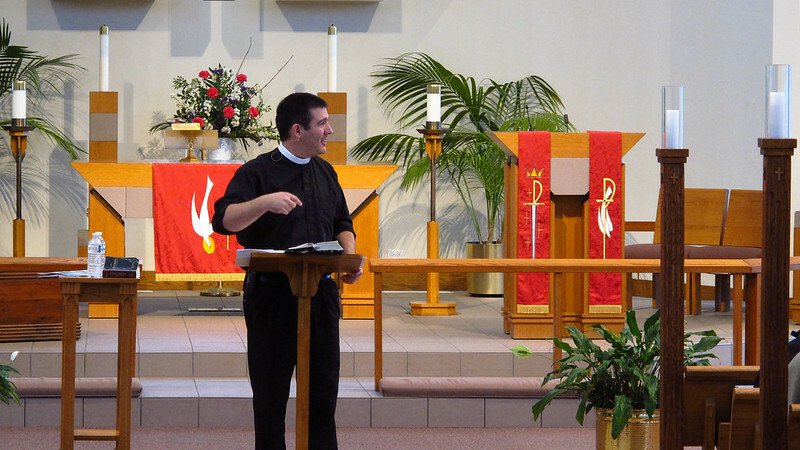 On Saturday morning, Pastor Joshua Scheer introduced the Reverend Larry Beane. Pastor Beane’s presentation was entitled, “Doctrine And/Or Practice?” During his presentation, he maintained that the entire Book of Concord was descriptive. 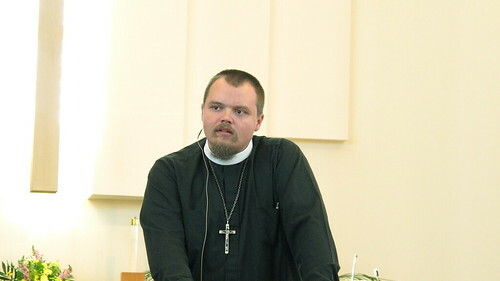 Pastor Hans Fiene was the second speaker on Saturday. Pastor Fiene is the creator of The Lutheran Satire. He spoke about when satire is appropriate to use in defense of the faith. The last speaker was Pastor Todd Wilken from Issues, Etc. Pastor Wilken spoke about our need for perspective, patience, and perseverance. Please go to the Brothers of John the Steadfast website, and check out all the audio presentations from the 2015 conference. Or check out the videos of the conference by clicking here. The Lord blesses his people when we gather to hear, discuss, and ponder his word and Sacrament. Thank you to all who were involved in making this an enjoyable conference. Click here for additional pictures from the 2015 BJS Conference. Click here for additional pictures from all the previous BJS Conferences (2009, 2010, 2011, 2012, & 2013). The Brothers of John the Steadfast held their fifth annual conference on Friday and Saturday, February 15 & 16, 2013 A.D. at Bethany Lutheran Church in Naperville, IL. 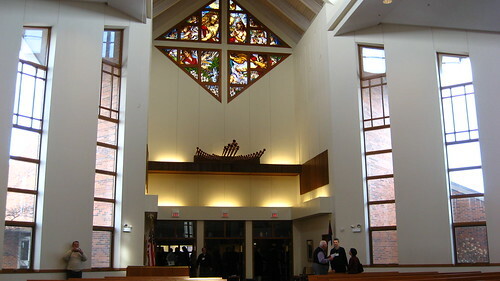 Bethany recently installed some new stained glass windows. 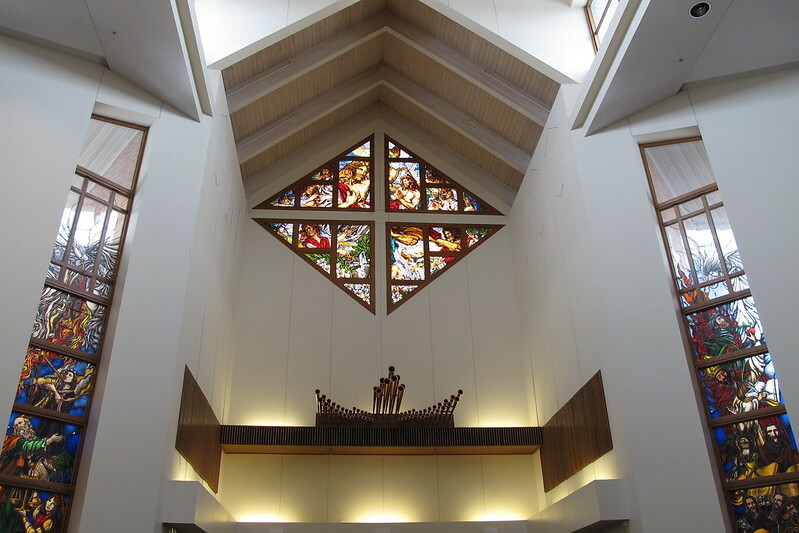 The window above depicts some of the church buildings in which Bethany has called home. 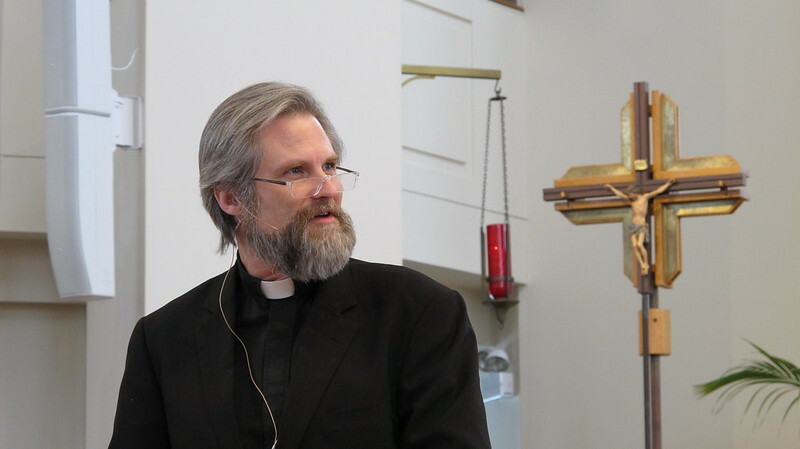 On Friday, Pastor Fisk spoke about being raised Lutheran, but not staying Lutheran, and the challenges we face in passing on the faith to future generations. One of the goals of the Brothers of John the Steadfast is to use new media to pass on the faith. 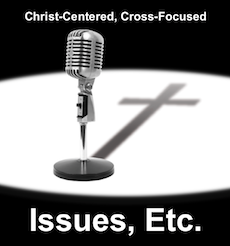 Pastor Fisk exemplifies that approach in his video podcast, Worldview Everlasting. Pastor Fisk’s presentation can be viewed on YouTube by clicking here. On Saturday morning, Pastor Bryan Wolfmueller, a co-host of Table Talk Radio, spoke about loving God’s word. (Click here to view the video of his presentation). Because God has filled our hearts with love, we also love one another. Every year the BJS conference features fine fellowship, delicious food, and generous hospitality. This year was no different. We were also treated to two fine sermons by Pastor Hans Fiene (“Steadfast in Doctrine, Steadfast in Love“) and Pastor Tony Sikora (“The Shallow Promises of the Defeated Devil“). 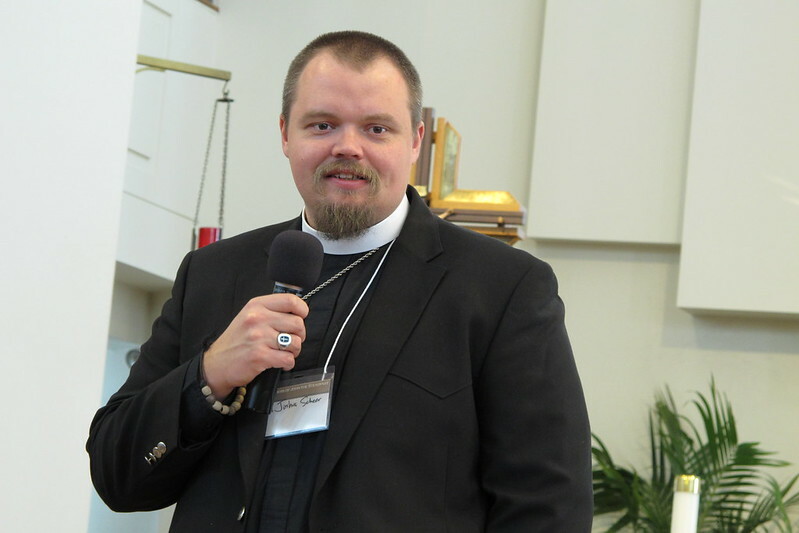 On Saturday afternoon, Pastor James May spoke about Lutherans in Africa. Pastor May said the best way to make disciples was by preaching and teaching the word of God. He said that Islamic missionaries were teaching their faith, while many Christian missionaries gave out T-shirts. We should never neglect people’s physical needs, but we should not pretend that helping other people physically is the same thing as teaching the gospel. The Church Growth Movement does not work in America or Africa. One story that stood out was of a mother who wanted her babies to be baptized, but could not afford the baptismal fees charged by the Roman Catholic priests. The fee for a baptism was $15, but $15 was two weeks wages in that part of Africa, and she had twins. She was trying to find a priest who would bless her babies for free, when she discovered Pastor May. 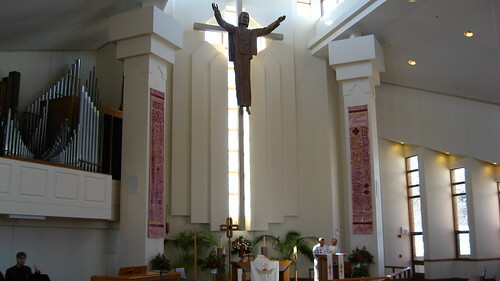 Pastor May explained that he was not a priest, but that baptism was not so much about becoming a member of the Roman Catholic Church, as it was about becoming united to Christ. The gospel is freedom, so Pastor May baptized her babies for free. Her children later died, and she was comforted by their baptism. She believed that baptism united her children with Christ and saved them because God so said. (Romans 6:3-5). Pastor May’s presentation can be viewed on YouTube by clicking here. 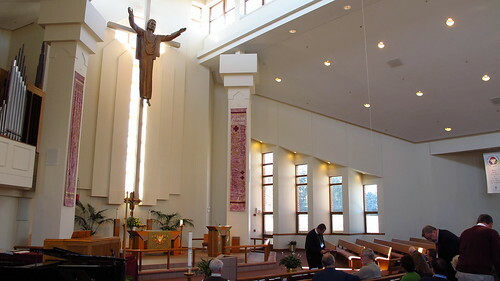 The picture above is of Bethany’s nave after the conference concluded. For additional pictures from this and past year’s conferences, click here. The Brothers of John the Steadfast held their fourth annual conference on Friday and Saturday, February 10 & 11, 2012 A.D. at Bethany Lutheran Church in Naperville, IL. 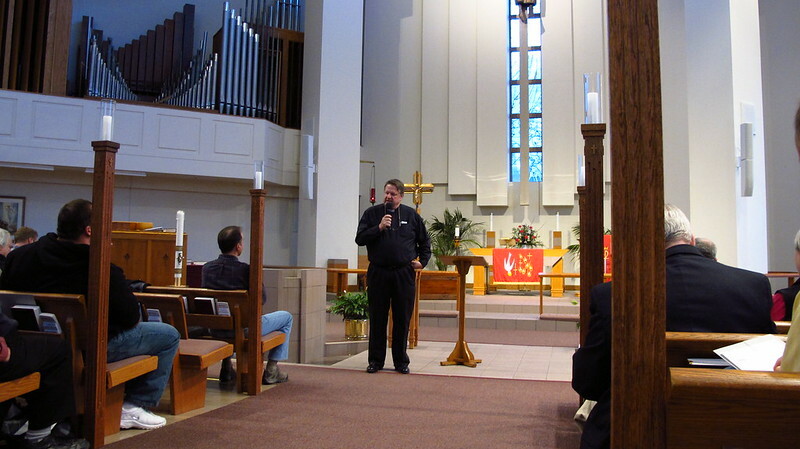 Pastor Bryan Wolfmueller, a co-host of Table Talk Radio, spoke on Saturday, February 11. Pastor Wolfmueller mentioned three attacks of the devil against the Church: First, he convinces us that theology is boring. This causes us to chase around after frivolous entertainments instead of living in the truly exciting word of God. Second, the devil convinces us that because good theology is difficult, we should avoid it for easier pursuits. Third, the devil puffs us up with our own self-importance so that we are afraid to be wrong or make mistakes. Pastor Wolfmueller emphasized that Christ’s name matters, not ours. We do not need to feel ashamed if we are wrong or make a theological mistake, because repentance and turning to Christ is all part of growing in grace. If we are afraid of making theological mistakes, then we will not talk about theology at all. However, God wants us to discuss his word, and let it dwell in us richly, not just as private individuals, but also as a Congregation of all believers. 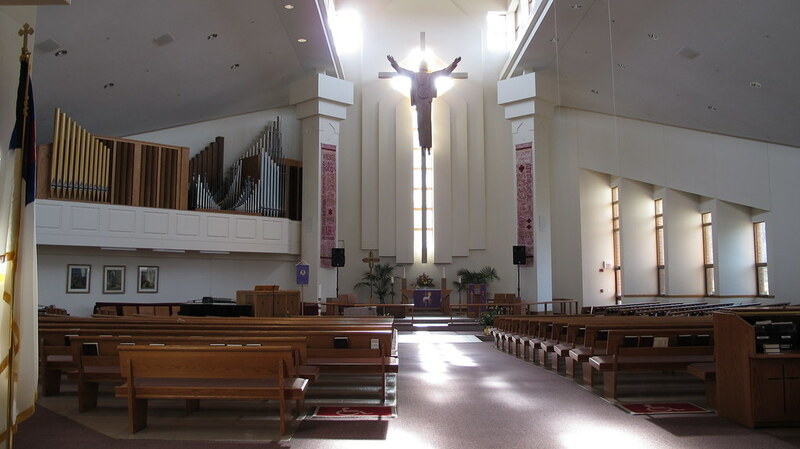 There was a small problem with the electronic speakers at Bethany Lutheran being slightly out of synch, which explains the echo in the video above. Friday’s inclement weather caused me to miss most of Pastor Fisk’s presentation. 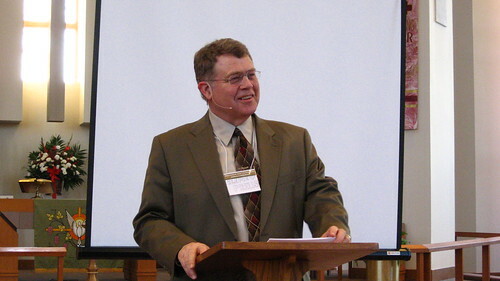 Pastor Fisk is best known for his video podcast Worldview Everlasting. Please check it out. One of the highlights of every BJS conference has been the outstanding liturgical music led by Cantor Phillip Magness of Liturgy Solutions. This year was no exception, and one of the Divine Services was done mostly a cappella. Pictured below are what appear to be horns in the back of Bethany Lutheran. I took the picture while standing under them looking up toward the ceiling. The other highlights of every conference so far have been the delicious food and generous hospitality of Bethany Lutheran Church in Naperville, IL. This year was no different. Pictured above are conference attendees arriving in the nave for Pastor Scheer’s presentation after lunch on Saturday. 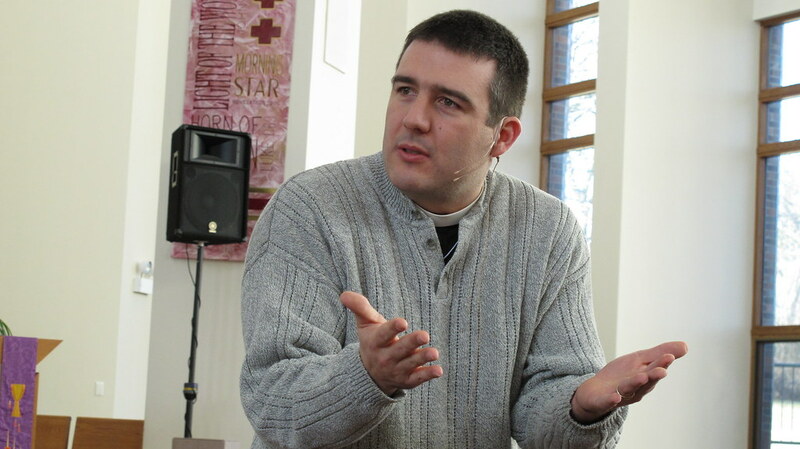 Pastor Joshua Scheer stated that theology is supposed to be the habitus for all Christians, including laymen, and that layman should love their pastors enough to hold them accountable. 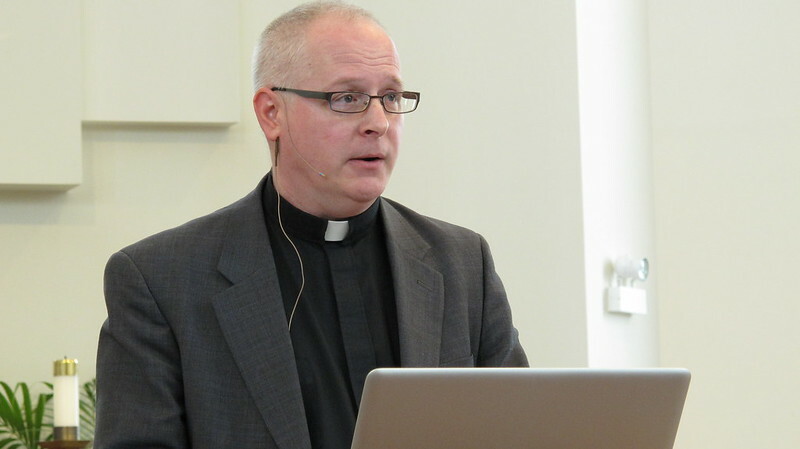 Speaking about the internet, Pastor Scheer said that today’s Christians face a temptation to become a sort of gnostic internet community based on mere knowledge and information sharing. However, while internet communities and relationships can provide good support and resources, they cannot fully reflect the theology of our Lord’s incarnation as a real physically present person. Therefore, all Christians (including pastors) should have a real physically present pastor, who stands in the place of our incarnate Lord, and delivers real physical gifts in word and sacrament. Also according to Pastor Scheer, our primary goal should not be to save our synod, but rather to save our Confession (of Christ). 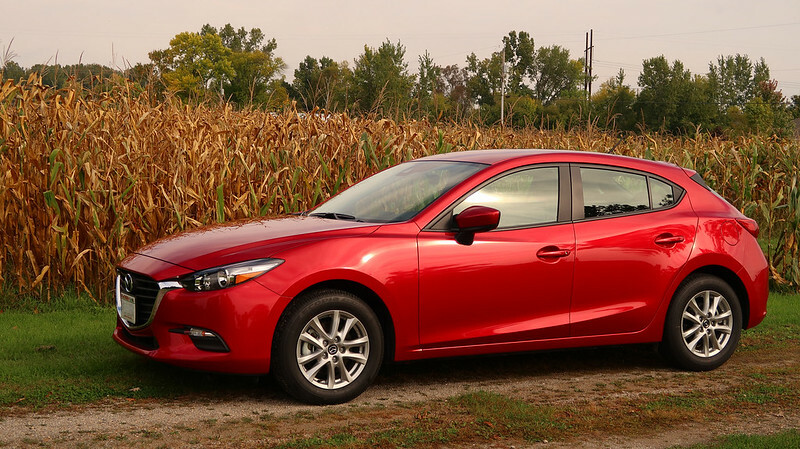 Pictured above: Brothers meet under the cross, before returning to their earthly homes. For additional information about the conference, check out Stand Firm. For additional pictures from past conferences, click here. 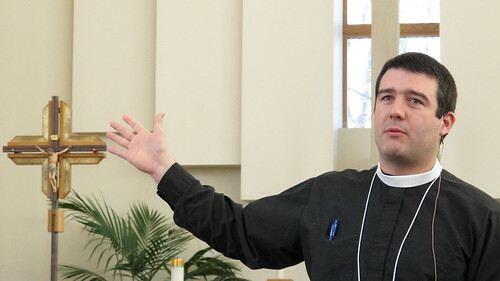 According to The Brothers of John the Steadfast blog, the Lutheran Church Missouri Synod (LCMS) President Matthew Harrison will be the keynote speaker at their third annual conference at Bethany Lutheran in Naperville, Illinois. “President Harrison will be speaking at the banquet on Friday evening,” February 11, 2011 A.D. 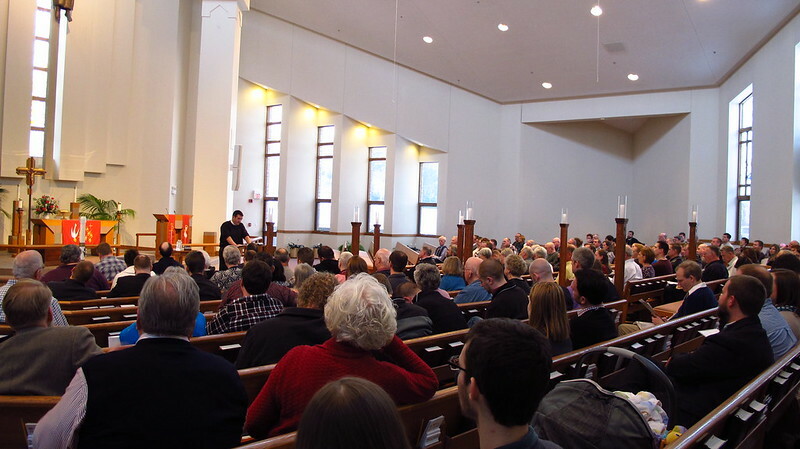 The speakers, music, and liturgy at the first two annual conferences were outstanding. 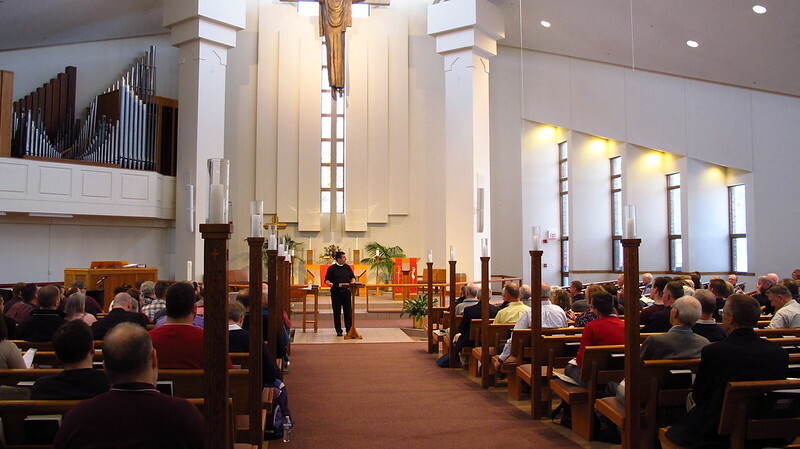 Attending these conferences was a blessing because they provided good Confessional Lutheran resources from and camaraderie with those who are attempting to be intentionally Lutheran. One of the goals of The Brothers of John the Steadfast is the promotion of genuine Confessional Lutheran theology and also new Lutheran media such as the Issues, Etc. radio program. 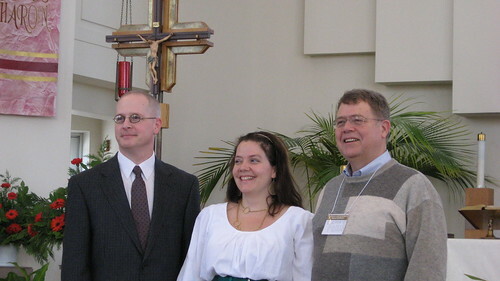 The speakers from February 2010 are pictured from left to right: Pastor Todd Wilken (the host of Issues, Etc. 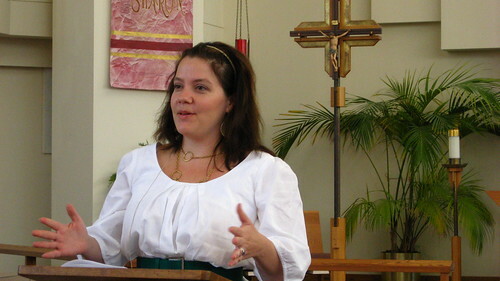 ), Journalist Molly Z. Hemingway (a writer for Get Religion), and Klemet Preus, the author of the popular book: The Fire and the Staff: Lutheran Theology in Practice. There were a number of notable pastors in attendance, including Lutheran Church Missouri Synod (LCMS) District President Herb Mueller. Also, President Schroeder of the Wisconsin Evangelical Lutheran Synod (WELS) sent Pastor Paul Prange to attend as an observer. 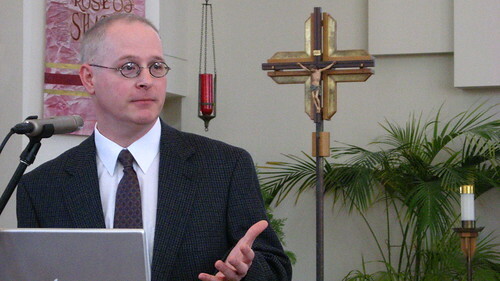 Pastor Prange is the former president of Michigan Lutheran Seminary and the current administrator of the WELS Board for Ministerial Education. (About WELS Leadership). 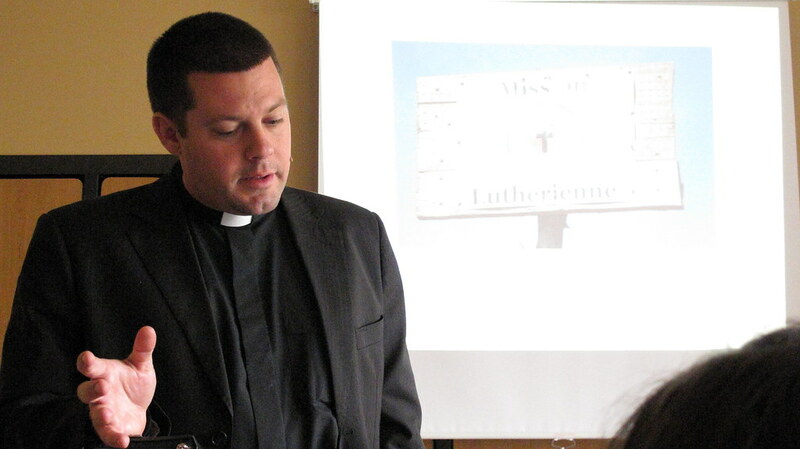 The first speaker on Friday was Klemet Preus, the author of The Fire and the Staff: Lutheran Theology in Practice. 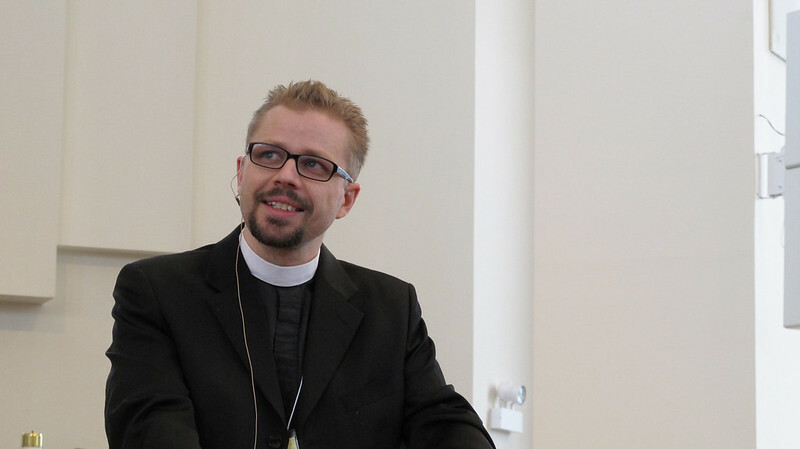 Klemet Preus’ presentation was entitled “Pressing Issues in Lutheran Practice Today: ‘Grace Alone. '” (Grace is what we get, works is what we do). Are Christians defined primarily by what we do for God or by what we get from God? Do our practices reflect this fundamental distinction? Are our practices founded upon the principle of grace alone, or are they founded partly upon what we do? These are the questions we must ask when evaluating our practices in the areas of unity, worship, and the ministry of word & sacrament. For example, true Christian unity is a gift from God that emanates from a common belief (what we get), not common goals (what we do). However, many Lutherans today act as though we achieve unity by rallying around common goals, irrespective of our worship and belief. Likewise, true worship is not about what we do for God, but rather what we receive from God. However, many nominal Lutherans are worshiping on a non-Lutheran model that emphasizes what we do (works) as opposed to what we get (grace). This diversity of worship does not reflect true Christian unity, which can be founded upon only unity of belief. On Saturday, Mollie Hemingway spoke about her experiences as a Lutheran journalist. Her vocation calls her, not to protect the image of the LCMS, but rather to tell the truth. Her presentation was spirited and enjoyable. On Friday, attendees were treated to several varieties of all-you-could-eat pizza, and later that evening there were generous parties at various locations, including the private homes of very gracious hosts. Then on Saturday there was a full breakfast followed by sandwiches in the afternoon. 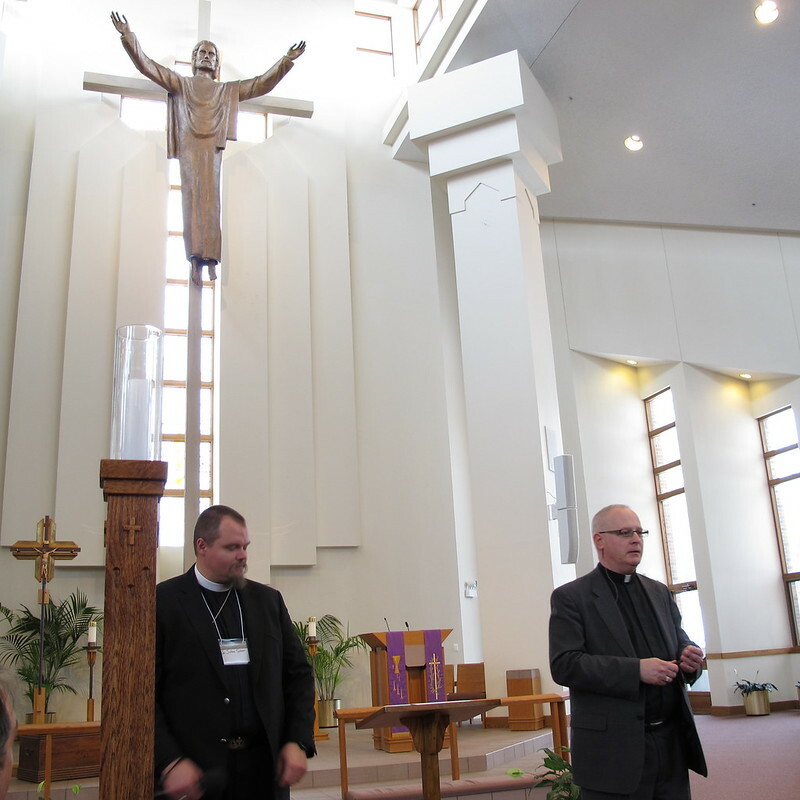 A highlight of the conference was the excellent Confessional Lutheran liturgical worship. Cantor Phillip Magness of Liturgy Solutions led the music for Vespers and the Saturday Divine Service. 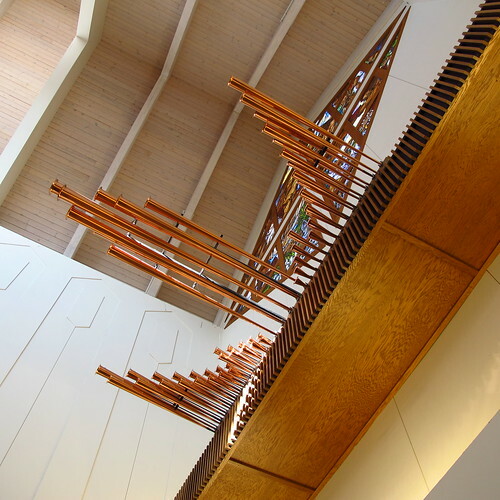 The widget below plays the Second Psalm of the day from Friday’s Vespers entitled “As Long as I Live” by David Haas (Psalm 146). The congregation and the choir sang the antiphon in a round. This antiphonal back-and-forth singing is especially beautiful because it allows for a “praise and worship” refrain coupled together with solid theologically true words from the cantor. Also, it is strongly suggestive of the way the Lord communicates with his bride: He sings to her, and she repeats his word back in joy. Notice also how in the Psalm we are advised to trust not men, but rather to hope in the Lord. We merely respond to all that he does for us: He gives us food, sets us free, gives sight, lifts up, watches over, sustains, and will reign forever. The Psalms are primarily about what God does and we get. Praise the Lord, my heart! My whole life, give praise. Let me sing to God as long as I live! 1. Put not your trust in princes; mortal men, who cannot save. Blessed is he whose hope is in the Lord, the God of Jacob. 2. The Lord gives food to the hungry. The Lord sets prisoners free. He gives sight to the blind and lifts up those who are bowed down. 3. The Lord watches over the outcast and sustains the widow and the orphan. God will reign! Forever He is Lord, to all generations. 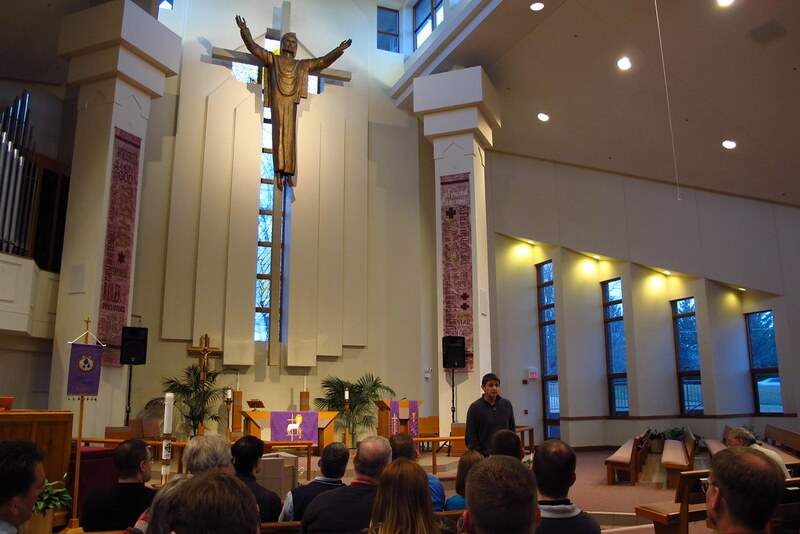 The final speaker was Pastor Todd Wilken, the host of Issues, Etc. 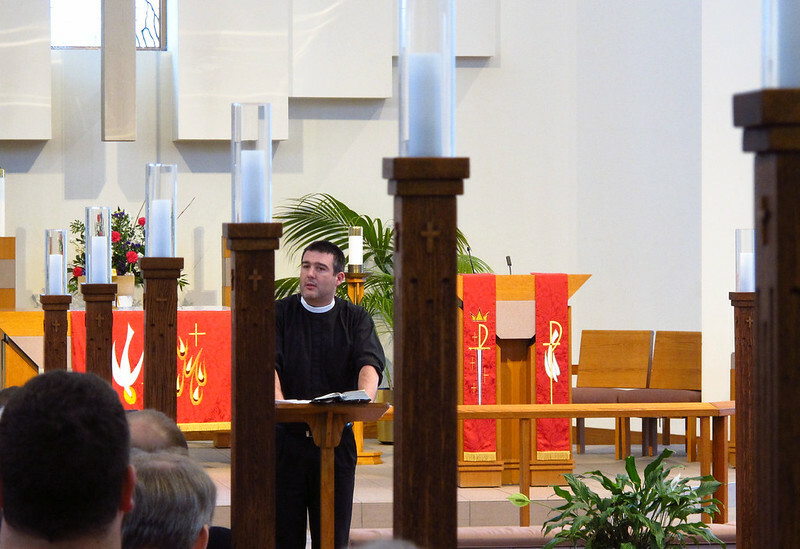 Todd Wilken spoke about a root problem in the LCMS: exceptionalism. Exceptionalism is the belief that a group can do no wrong and is an exception to the rule that men err. Many Lutherans believe their synod can do no wrong, therefore, they do not worry about worshiping like Pentecostals or using un-Biblical materials because they believe those anti-Lutheran materials cannot hurt them. 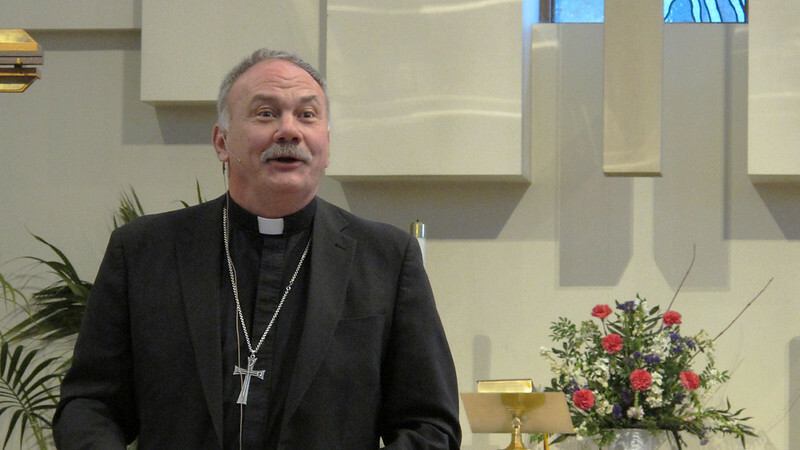 Exceptionalism has caused many Lutherans to stop being intentionally Lutheran in doctrine and practice, and to assume that everything the LCMS does is Lutheran just because it is the LCMS. The result of exceptionalism is the failure of Christians to be on guard, which eventually results in the loss of the Gospel of Jesus Christ. If the majority of WELS members were to read this blog post, many would think, “Yes, the LCMS is infected with exceptionalism, but that could never happen to the WELS.” Unfortunately, exceptionalism is not limited to the LCMS. In an age of living apostles, Paul said, “Be on your guard! Remember that for three years I never stopped warning each of you night and day with tears.” (Acts 20:31). If such stern warnings were warranted in an age of living apostles, then how much more do those warnings apply to us! Many thanks go out to the volunteers, speakers, and hosts that helped make this conference so enjoyable. Does anyone go to school to learn how to become a beggar? Who wants to become a beggar? No one. But the truth is that because of the disaster of original sin, all men are spiritually destitute. We are dead in sin. (Ephesians 2). Because our spiritual life and health depends on receiving from Christ, we exercise our faith by becoming beggars before God. And that’s not easy for us who fancy that we are producers of spiritual goods and owners of spiritual gifts. The place to begin learning to receive is our regular involvement in the Divine Service. The classical order for the Service of Word and Sacrament puts us and keeps us in the position of beggars before God. It invites us to join the company of holy beggars in four important places. In the Gloria in Excelsis, we stand before God the Father, together with angels in the heavenly realm, and ask for Jesus to intercede for us with Him there. In the Prayer of the Church, we beg for help from God the Father for the entire Church, the entire world, and all people in need in the name of Jesus. But, most significantly, in the Agnus Dei, we come as beggars to Jesus, the host of our Holy Meal, to receive His peacemaking body and blood as food for our journey to heaven. We best learn the art of begging from God, quite practically, by bringing ourselves and others, our needs and theirs, each week to Him in the Divine Service. [Grace Upon Grace: Spirituality for Today by John W. Kleinig, Concordia Publishing House, St. Louis, 2008 A.D., page 55. Emphasis and bullet points added]. All of life, both physically and spiritually, is a continual reception from God. God gives us life, and our lungs beg for air. Our throats thirst for water. Our stomachs hunger for food. And our spirits long for the word of God. everyone who asks receives; he who seeks finds; and to him who knocks, the door will be opened. “Which of you, if his son asks for bread, will give him a stone? Or if he asks for a fish, will give him a snake? If you, then, though you are evil, know how to give good gifts to your children, how much more will your Father in heaven give good gifts to those who ask him! [Matthew 7:8-11]. Many enthusiastic church services are just talk. But in the Divine Service we are intentionally put in the position of those who ask, who really ask, who beg. When one asks a neighbor to borrow a cup of sugar, they do not plead, “Lord, have mercy! Christ, have mercy! Lord, have mercy!” In the Divine Service we do not ask for what we merely want, we beg for what we need. We do not ask for what we can pay for, but rather we beg for that which we do not deserve. The Divine Service puts us in the position of beggars. But the greatest divine service is not just that we ask, but that we also receive. “Blessed are the poor in spirit, for theirs is the kingdom of heaven.” (Matthew 5:3-5). 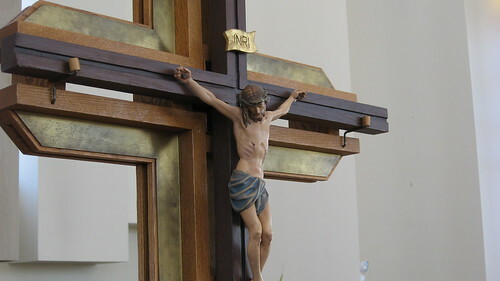 Those who (by the grace of God) regularly plead for and receive mercy from the cross of Christ as their very life-blood will imbibe and internalize a theology deep and rich and rewarding and true. This is more than just pure doctrine, it is true practice. It is the practice of breathing and drinking and living the life-giving Gospel of Jesus Christ. He is the way, the truth, and the life. (John 14:6). He is our head and source of life who is to be praised forever. I have heard from reliable witnesses that faction and disunion have arisen among you, because some of your preachers do not teach and act in accord, but each follows his own sense and judgment. This causes confusion among the people. It prompts both the complaint, “No one knows what he should believe or with whom he should side,” and the common demand for uniformity in doctrine and practice. In times gone by, councils were held for this purpose and all sorts of rulings and canons made in order to hold all the people to a common order. But in the end these rulings and canons became snares for the soul and pitfalls for the faith. So there is great danger on either side. And we need good spiritual teachers who will know how to lead the people with wisdom and discretion. For those who devise and ordain universal customs and orders get so wrapped up in them that they make them into dictatorial laws opposed to the freedom of faith. But those who ordain and establish nothing succeed only in creating as many factions as there are heads, to the detriment of that Christian harmony and unity of which St. Paul and St. Peter so frequently write. [Satan will] use external divisions about ceremonies to slip in and cause internal divisions in the faith. This is his method, which we know well enough from so many heresies. Now even though external rites and orders—such as masses, singing, reading, baptizing—add nothing to salvation, yet it is un-Christian to quarrel over such things and thereby to confuse the common people. We should consider the edification of the lay folk more important than our own ideas and opinions. Therefore, I pray all of you, my dear sirs, let each one surrender his own opinions and get together in a friendly way and come to a common decision about these external matters, so that there will be one uniform practice throughout your district instead of disorder—one thing being done here and another there—lest the common people get confused and discouraged. For even though from the viewpoint of faith, the external orders are free and can without scruples be changed by anyone at any time, yet from the viewpoint of love, you are not free to use this liberty, but bound to consider the edification of the common people, as St. Paul says, 1 Corinthians 14 [:40], “All things should be done to edify,” and 1 Corinthians 6 [:12], “All things are lawful for me, but not all things are helpful,” and 1 Corinthians 8 [:1], “Knowledge puffs up, but love builds up.” Think also of what he says there about those who have a knowledge of faith and of freedom, but who do not know how to use it; for they use it not for the edification of the people but for their own vainglory. Now when your people are confused and offended by your lack of uniform order, you cannot plead, “Externals are free. Here in my own place I am going to do as I please.” But you are bound to consider the effect of your attitude on others. By faith be free in your conscience toward God, but by love be bound to serve your neighbor’s edification, as also St. Paul says, Romans 14 [15:2], “Let each of us please his neighbor for his good, to edify him.” For we should not please ourselves, since Christ also pleased not himself, but us all. – Translated by Paul Zeller Strodach; Revised by Ulrich S. Leupold; Luther’s works, vol. 53: Liturgy and Hymns (J. J. Pelikan, H. C. Oswald & H. T. Lehmann, Ed). Philadelphia: Fortress Press. Emphasis added. This conference was significant because it stressed the importance and centrality of worship in our lives as God’s people. 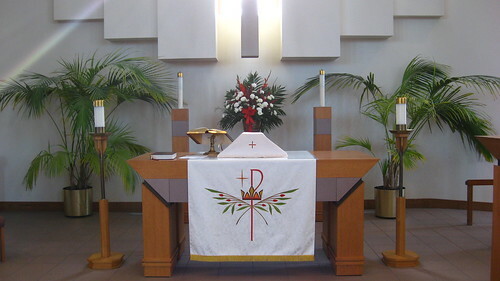 And as the case was made for the importance of worship, the point was made again and again that confessional Lutheran worship can and should be done with a commitment to excellence and with an appreciation for the heritage of liturgical worship that has been passed down to us by Christians throughout the ages. What was most striking was the reminder that truly Lutheran worship is not centered on us, but on Christ and the proclamation of the timeless gospel. Amen. Please pray for the Christian Church.